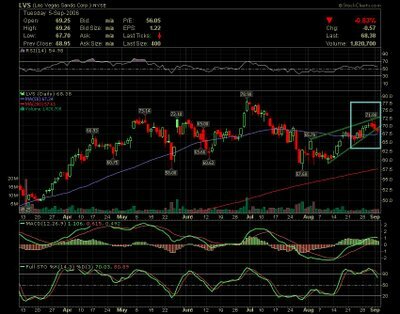 Shares of Las Vegas Sands Corp. ( LVS ) down near 1% closing at 68.38 but the important point is that the stock broken the ascending wedge according to the daily chart above. In the short-term it is quite likely to see a retest of the 66$ support, let's see if the stock will confirm this movement tomorrow. Keep in mind : Trading stocks involves risk, this information should not be viewed as trading recommendations. Key Word : The trend is your friend !!!!! Nasdaq near to reach the 2000 points !!! Stocks rebound from the lows,...but and now ? Stocks still under fire !!! !